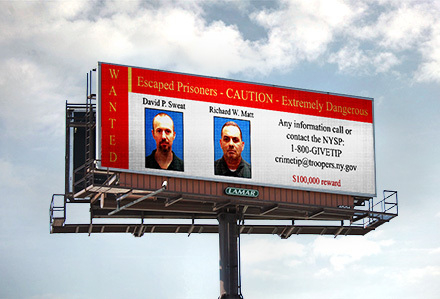 The New York State Police today announced that more than 50 digital billboards in New York, New Jersey, Massachusetts, Connecticut and Pennsylvania are featuring photos and information about the two men who escaped from the Clinton Correctional Facility in Dannemora, New York. This is part of the continuing effort to notify the public of the escape and generate new leads in the case. The digital billboards, which were donated by Lamar Advertising, are displaying photos and information about 48-year old Richard Matt and 34-year old David Sweat. The pair of convicted murderers were discovered missing from the Clinton Correctional Facility on Saturday. The billboards are located in the New York City area, Capital Region, Central and Western New York, as well as near Boston, Massachusetts and North Central and Erie, Pennsylvania. Richard Matt, 48 years old, is a white male, 6’ tall, 210 pounds, with black hair and hazel eyes. He has tattoos on back “Mexico Forever”, a heart on his chest and left shoulder, and a Marine Corps insignia on his right shoulder. David Sweat, 34 years old, is a white male, 5’11” tall, 165 pounds, brown hair and green eyes. He has tattoos on his left bicep and his right fingers. Both are considered to be a danger to the public. If located DO NOT approach them. Contact 911 immediately. The public should make no hesitation to report any suspicious activity; that includes any sign of a trespass, burglary or vehicle larceny. Contact 911, your local law enforcement agency, or the New York State Police to report any information related to this investigation at (518) 897-2000 or 1-800-GIVETIP. Tips can also be sent by email to crimetip@troopers.ny.gov. 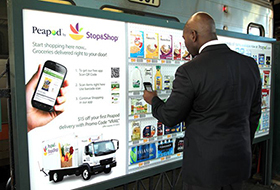 A study by RealityMine using USA Touchpoints conducted for the Outdoor Advertising Association of America was just released that shows how effectively the “traditional” OOH medium has adapted to mobile advertising. One of the key findings of the study was that OOH advertising was effective at communicating information to consumers both near the time many purchase decisions are made and often near the place that such decisions are made.